I am excited to be doing Snowcamp again this year. This is the tenth year and I have frozen a hundred or more artists using this workshop. Perhaps you would like to be one of them. The first session is full, and this year I am adding a second. 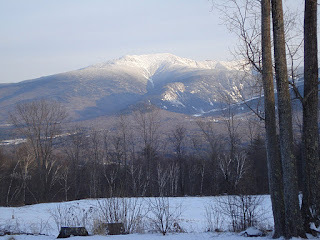 The workshop will be held March 2-4 at the Inn on Sunset Hill above Franconia, New Hampshire, as usual. The inn is informal and a little bit funky. Here is a picture of the place below. 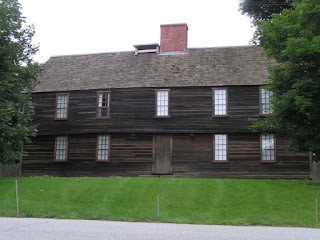 How Old New England is that? The workshop will begin on Saturday morning and end Monday evening when the light fails. That's three days. I charge 300 dollars per person, a 150 dollar down payment and 150 dollars to be paid at the event. Please understand this is a non refundable deposit. If you sign up I will hold a place in the class for you, regardless of whether you actually intend to come. That is what the deposit hires me to do, and guarantees you will receive. So please don't sign up unless you are planning to come. Snowcamp is a winter workshop. It can be very cold. The class is limited to twelve, or sometimes twelve and a monitor. So everyone gets plenty of personal attention. Each morning I do a demo and then students paint while I run from easel to easel teaching each student individually. I have several painting exercises that will help build the student's skills in landscape painting that I work into the schedule. We meet for breakfast and dinner. After dinner I do a slide show on the history of landscape panting and the design ideas in selected artist's work. The camaraderie is an important part of the workshop and we will all be good friends before the workshop is over. Snowcamp is a lot of fun, and I hope to teach you as much as I possibly can in the three days it runs. I can save you YEARS of screwing around! This is as intense an experience as I can make it and you will do little but paint, eat, and sleep while you are there. I will work you like a borrowed mule. 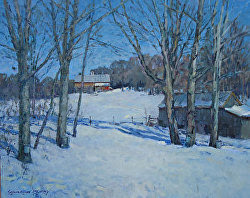 One of the important things I teach about snow painting is the opalescent color of snow. I will show you a system for creating the look of snow in light using broken color. Snowcamp usually fills, so if you want to come, sign up. The inn takes care of all our needs and it is required that you stay there to participate. If you absolutely must stay off campus, a day rate can be arranged with the inn. All of the lodging and reservations can be made with the Inn on Sunset Hill. If you go to their web site or call them be sure to ask for the special rate the make for the workshop. The inn has meal service for us and a beer and wine cellar. We are able to keep our equipment in the lower level so we won't have to drag our kit back to our rooms every night.. The procedure is this, first call the inn, their number is 603-823-7244, book your room, and then sign up using the button below. Vibrating color, or broken color is a way of enlivening the passages of a painting. Instead of laying a flat tone like a house painter might, the paint is applied in dots or rice like strokes that the viewers eye assembles at a distance. This confounds the eye a little, mimicking the complexity of nature, producers more interesting color than a flat tone, and gives a shimmering and lively look to the painting. Vibrating color is a form of pixilation, but unlike on your TV screen or in a newspaper photo is large enough to be noticeable, but still small enough for the viewers eye to read it as an image. Here is a demo I did on how to lay a painting in with broken color. 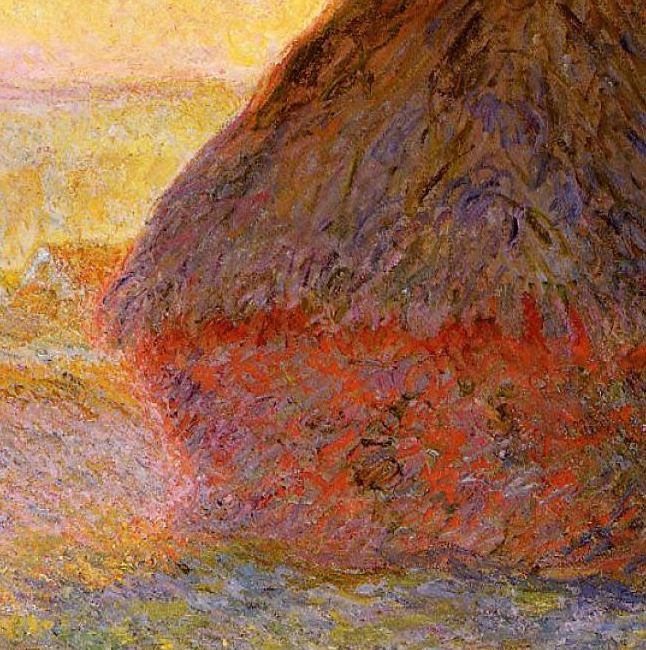 Painters have used color vibration since the renaissance, but the impressionists are characterized by its use. Here is a passage from the Willard Metcalf painting above. 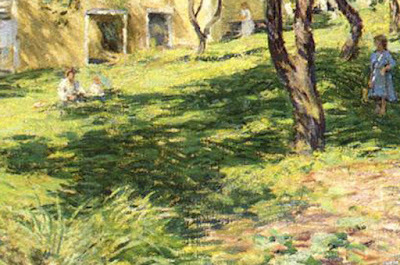 In the shadow passage here you can see Willard dropping little brushstrokes of different values that give transparency and life to the shadows. The shadow is made transparent because we look within it and perceive those darker marks. In fact, that is how you get transparency into a shadow, put something in there to be perceived, the viewer looks into the shadow and sees something within, hence it is transparent. A couple of little dark accents will do it, without those the shadow would read as flat. If you were to slide a wedding ring across this painting virtually everywhere you would find a blizzard of little strokes of different color, rather than a single flat tone. If you look in the lower right hand corner you can see the different strokes of color assembling to show the color of the earthen path there. Instead of mixing all of those colors he sees in that path into a single note, which he certainly could have done, he lets them mix optically. Sometimes this is called divisionist color. It looks much more lively than a flat tone would. Below is a Hassam that is full of broken color. This method gives the painter out on location a number of advantages, first, it is really fast, with changing light, time is very important. 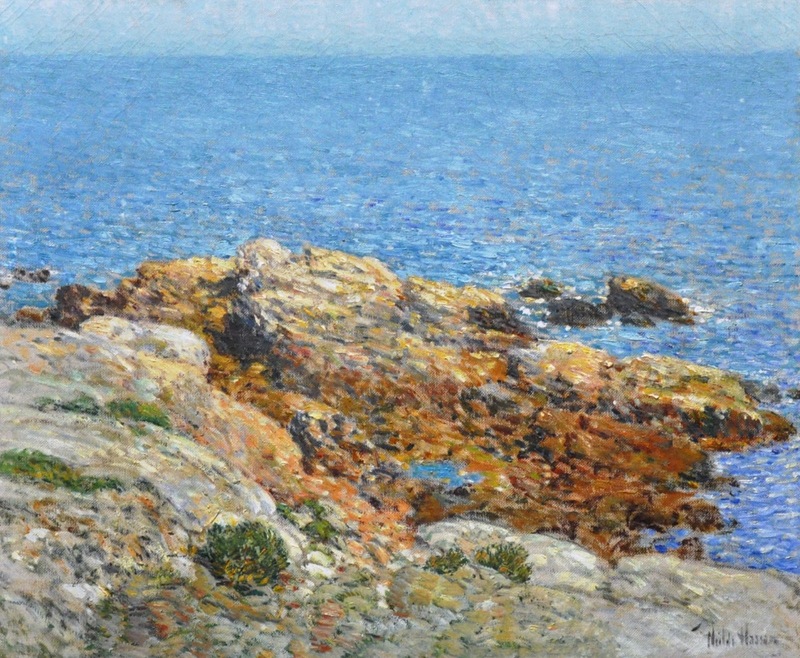 Hassam isn't painting individual rocks but the appearance of the whole area. 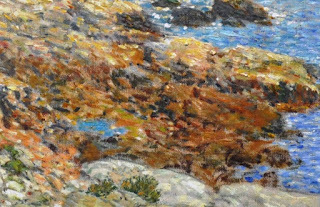 Because his brushstroke or pixel size is "fixed" he doesn't need to add ever smaller detail such as little cracks between the rocks, he has thus limited his resolution. The viewer will imagine all the little details for himself. This is also more like the way we really see, broadly without examining all of the little details of a scene, apprehending the entire scene at once instead of a hundred closeup photos stitched together. Here is a picture that is entirely made of broken color. It has the look I call "colored rice". There isn't a flat area in the whole thing. The treatment here has made the picture. It is not "what it is a picture of" but "how it is a picture of" that is important here. 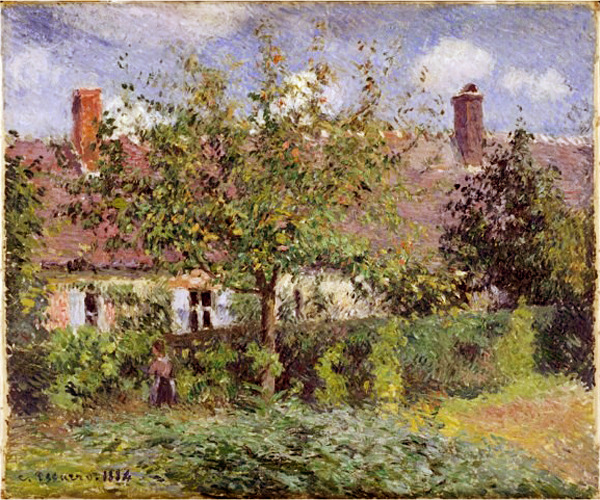 This could have been a very matter of fact picture, but Pissarro makes it exciting because of the way he chose to handle the paint. The painting dances before us in a joyous flurry of febrile excitement. It is deliberately both nature and paint at the same time. 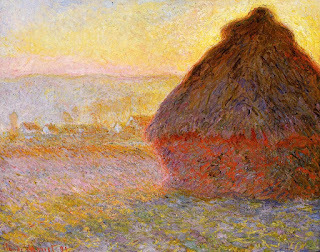 Below is one of Monets Haystacks series. and here is a closeup of that. This is the same technology pushed to a greater extreme than the previous examples ( which were made later, incidentally) Monets only interest is the effect of light, There is not much expression of the solidity or form of the subject. 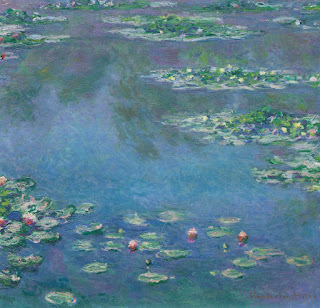 This was sort of a series of science experiments for Monet as he was more interested in this point in perfecting the broken color technology than picture making. But when he had it figured out he returned to making pictures using these new ideas. 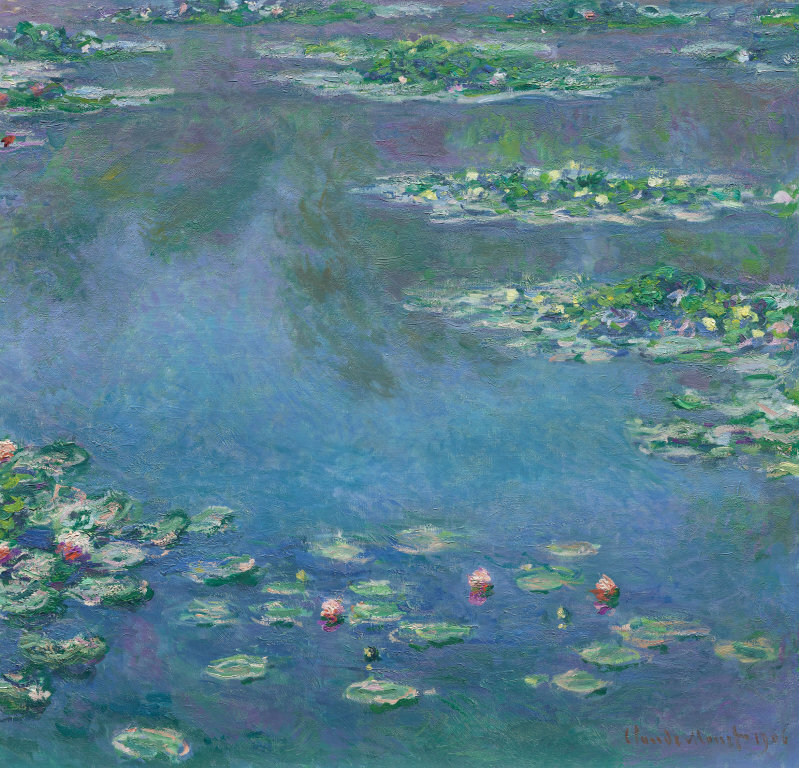 Here is a water lilies painting that is a picture. 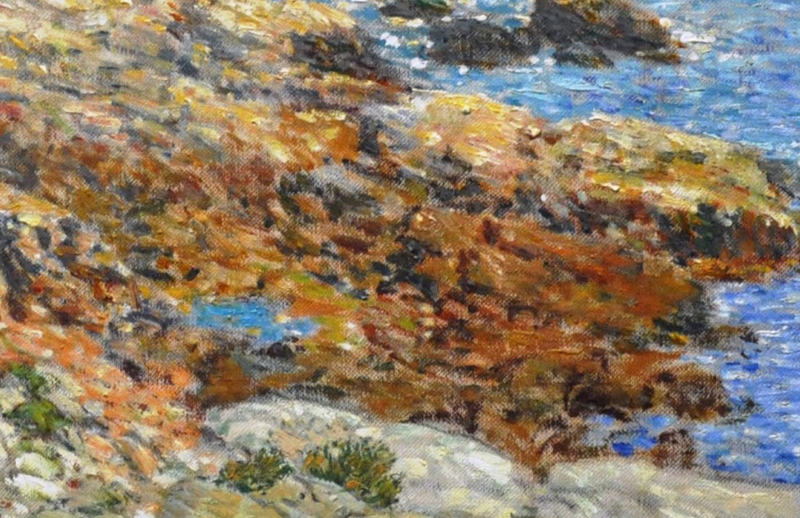 You can see his use of the divisionist color particularly well in the water in this one. People are enthralled by broken color brushwork and they will remark on how the painting looks like nature from viewing distance but when they walk up to it find only abstract looking marks. They are entertained by the slight of hand. This is a method or a tool however. Like most ideas or methods in painting it brings advantages and disadvantages, there are always trade offs. 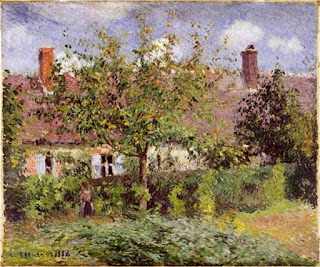 This type of handling can destroy form, some of the French Impressionists sacrificed form to get the effect of scintillating light, some of their work, Renoirs for example can look as if they are made of feathers. The painters of the next generation modified this kind of technique to reclaim form in their paintings and still get the benefits of this kind of handling. When next I write I will go into that a little. 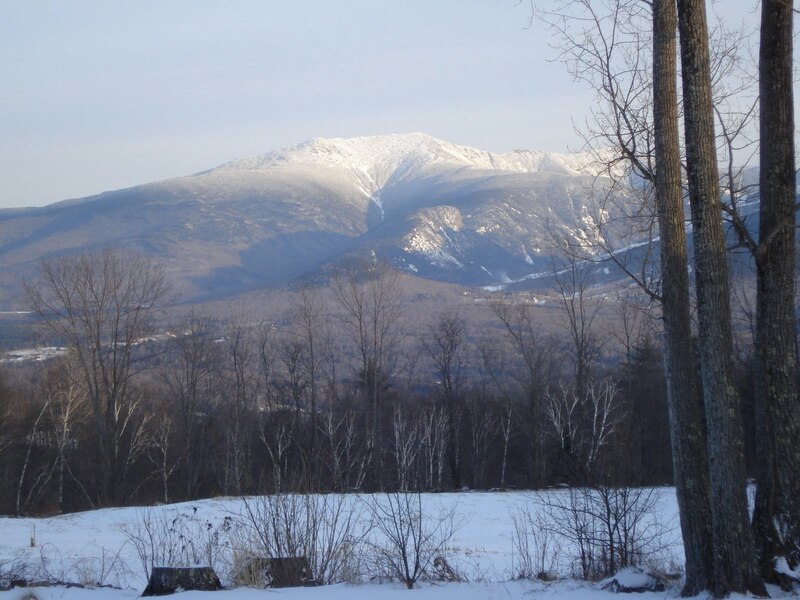 Here is a view from Sunset hill, where I will be teaching the dreaded Snowcamp again this year February 25th, 26th, and 27th. If you would like more information please click here. James Gurney sent me a copy of his new video and I enjoyed it. This is not really a basic how-to video, his books cover that. If you haven't read those, they are excellent and have been best sellers for years now. Here is a link for those. James Gurney is a best known for his Dinotopia books. I don't care much about fantasy illustration, for me, James is interesting because he draws so well. He lives with a sketchbook in his hand and can explain clearly how he works. Almost everyone who paints can learn a lot from his two books, "Light and color" and "Imaginative realism". I was introduced to James at a party in Connecticut by Thomas Kinkaid ( of all people) before either one of them was particularly famous. 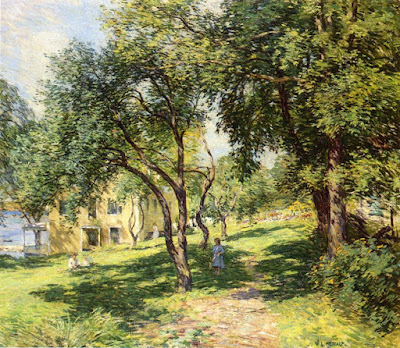 James referred to me as a plein air painter, I had seen the word in print, but it was not in common usage, in fact I had never heard it spoken aloud. In those days we just painted outside. He had with him the first painting for what would become his Dinotopia book. I was impressed by his draftmanship. There were very few people doing "realist" art in those days, and fewer still operating at that kind of level. The party was full of New York illustrators who were trying to figure out their next move as that market was rapidly contracting. I had just opened my first gallery in Rockport a few years before, so it must have been in the mid eighties. 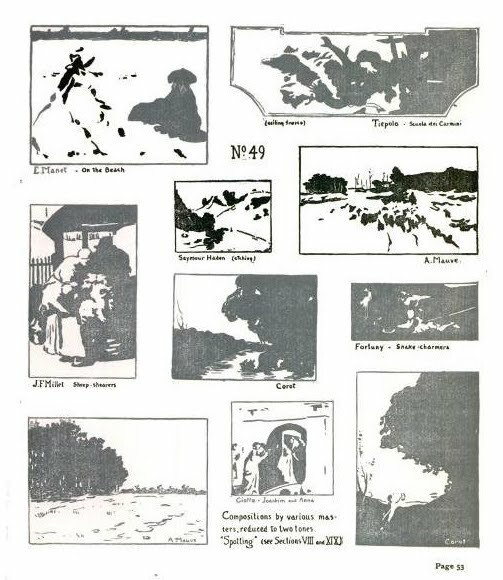 James has a long running blog called Gurney Journey, and within that he has posted an exhaustive explanation of his painting technique and nineteenth century academic art. Many of you have already found it, but if you haven't you need to go have a look. James has given away a nearly boundless amount of information. His interests reach into cutting edge science, robots, and lots of Paleontology. But if you search his archives there is every sort of advice on how to make paintings. Here is a link to that. Blogging is, as I know from experience, not a paid effort. One blogs, at least in this part of the art world, to be useful to your fellow artists. It does build reputation and name awareness, but compared to the massive effort involved it would be easier to promote your art in the press and galleries. Those of you have read my blog may have noticed I never blanket recommend that starting a blog is the way to artistic success. Back to the video. It is divided into two chapters, the first has James on location painting a street scene. He adds a flying car, and shows how he uses a small toy on location to do it. I can't imagine putting a flying car in one of my pictures, but who am I to say, having featured the occasional burning phone booth? The value of this is watching a master of drawing slice up a location picture like a roast. It is an excellent demo of outdoor painting skill, done with a bit of humor. The second part of the video is where the best information lies. Gurney takes an idea, a typical science fiction kind of idea, a giant and malicious robot visiting the modern suburban landscape with unpleasant results. He shows how he develops the idea through sketches. With a few false and subsequently rejected ideas, James shows how he builds an imaginary scene. He shows his rejected ideas and explains why they aren't working the way he wants. He then makes studies of construction machinery out in the field and uses their aesthetic and engineering principles to design an enormous robot that looks as if it was built by the same makers. Which is probably how it would happen should we decide we need such machines. 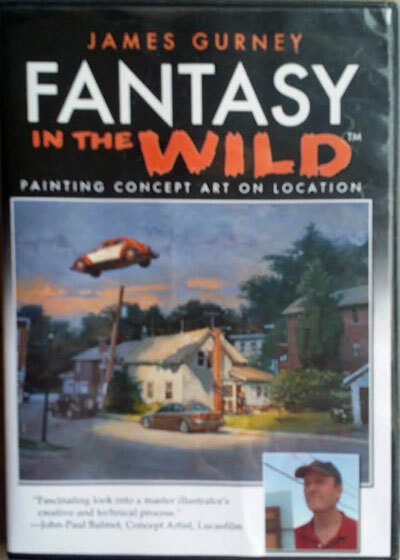 Again, I don't care much about the fantasy genre, but the way that Gurney goes about this is the same way that illustrators like Rockwell or academic painters like Gerome approached the same problems. How do you make a convincing representation of something that doesn't exist? Gurney makes sketches, little models that he can study, and eventually several sketch versions leading to the final painting.There is a lot to be learned from this. I always think that knowledge in this art is so hard won and attaining it so time consuming that anytime you can spend a little money and shortcut some of that labor it is well worth it. There is a lot to be learned from this, particularly if you are interested in painting history pictures or want to construct paintings based on your ideas, rather than scenes you can set up in front of. The annual dreaded Snowcamp workshop returns to the Inn on Sunset Hill, above Franconia, New Hampshire. I will be teaching on Saturday the 5th through Monday the 7th of March 2016. This is my favorite thing I do every year. You can join the group for an intense ( to say the very least) workshop overlooking the White Mountains. The views are enormous and we will paint from the grounds of the hotel itself. That means no caravanning around in cars. I teach all the aspects of landscape painting besides just snow painting and in the evenings I do a power point presentation on designing paintings and the history of landscape painting. This is a breakfast till bedtime workshop. We do nothing else for three days. I will work you like a borrowed mule. The 150 year old inn is as New England as can be, it is under new ownership and is the ideal place to do a workshop. We will take our meals there. I generally park my car in the lot and leave it there until the workshop is over. If it is actually snowing there is an enormous covered back porch that overlooks the mountains on which we can paint . The camaraderie is wonderful and many students repeat year after year. I limit the class to about a dozen, so if you want to come, sign up using the button below. I is required that you stay in the inn to participate in the workshop. Before you sign up you probably want to call them first and book your room. Their phone number is 603-823-7244, they have a special package rate for my students. The total cost of the workshop is 300 dollars, the button below will allow you to pay the deposit and the balance will be due at the event. 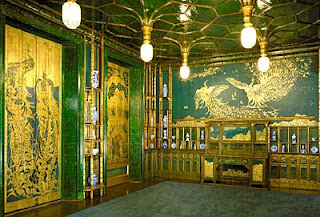 Arthur Wesley Dow, and a disjointed ramble through late Victorian design fads. 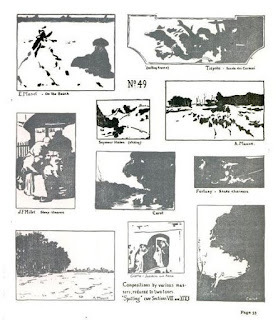 The above illustration is from a book "Composition; Line, Notan, and Color by Arthur Wesley Dow (1857-1922) who lived in Ipswich, Massachusetts. He studied in the 1880's in France at the Academie Julian and with Gustave Boulanger and Jules-Joseph Lefebvre. He trained alongside both Edmund Tarbell and Willard Metcalf .Upon his return to Boston, he began studying the Boston Museum's great collection of Asian art, particularly Japanese prints. For a time he was actually the assistant curator of those. 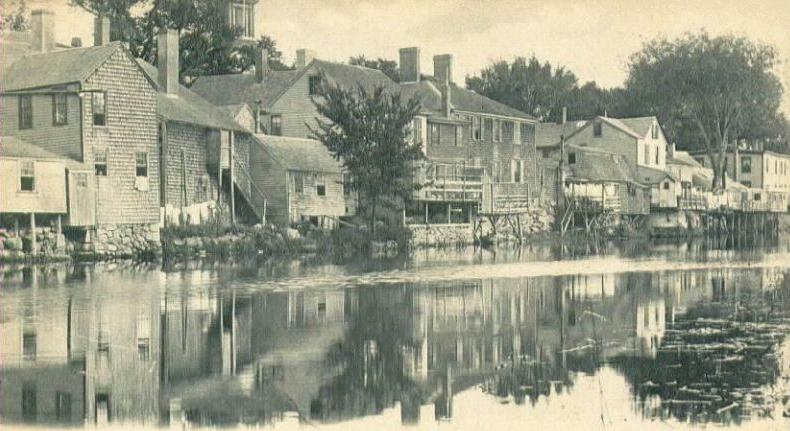 Dow opened a teaching studio in Ipswich, the surroundings must have made it a great place to study, Ipswich has more standing architecture from the 1600's than any other town in America. Here is a photo of what it looked like then. 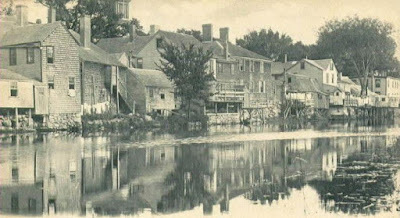 Here is a photo of Dows home, where he taught summer workshops. Dow as a teacher was concerned about the emphasis on realistic description that dominated the art instruction of the day. He, like Whistler, supported a more artistic approach based on the parts of painting apart from actual representation. Color was one of those, not transcribing color as it sat before the artist in nature, but building inventive and deliberate arrangements of color. But his greatest concern was with composition.Dow spent a lot of time studying not only Japanese prints but oriental rugs, Arabic script, and decorative arts from around the world. 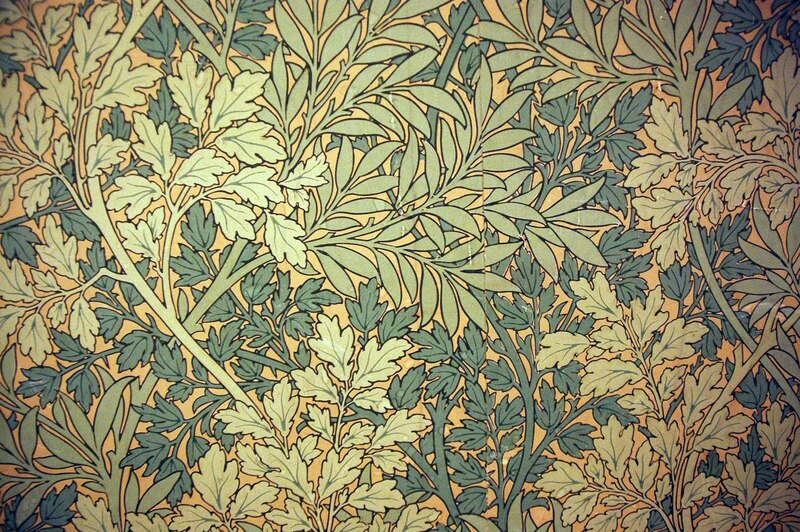 He became an exponent of the Arts and Crafts movement. To place Dow in context I am going to show some Arts and Crafts history real quick.This was a late 19th century to early 20th century return to simpler handmade , (or handmade looking) decorative objects which often made a point of showing their construction. 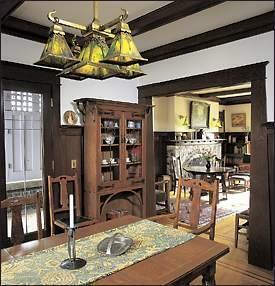 Below is an example of an arts and crafts interior. Along with this style came a great surge of interest in design, and particularly pattern design as might be found in fabrics and wallpaper. 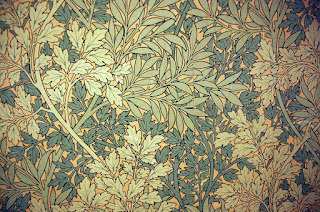 William Morris (1834-1896) was a Scottish designer who was a leader in the Arts and Crafts movement. 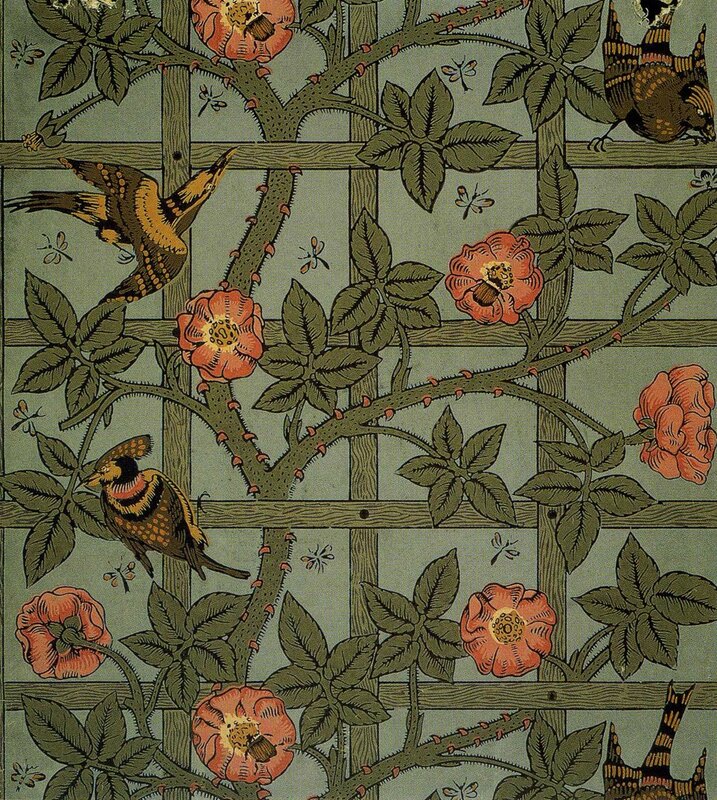 Below is an example of several of his influential wallpaper designs. Many of the ideas underpinning this style came from James McNeil Whistler (1834-1903) who advocated "art for arts sake" That is, art was to be beautiful because of what it looked like, rather than having a purpose, like advancing a political or sociological agenda. Its whole purpose was its appearance, not a moral to be taught or a narrative. The earliest phase of these ideas were mostly manifested in the decorative arts and architecture. Owen Jones (1809-1874) published in 1856 "A Grammar of Ornament". 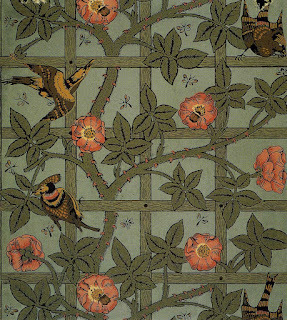 This was a profusely illustrated catalogue of ornamental designs from all cultures and periods. Artists and designers plundered the book for the rest of the century, mixing and matching styles and patterns to create the Victorian styles, of which the aesthetic period was a late variation, This style was only popular for the 1880's. Below is an example of aesthetic movement design, Whistler's Peacock Room, from 1877. 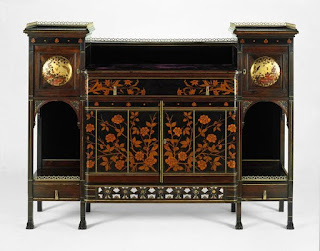 Below that is an example of aesthetic period furniture. There were also enormous amounts of Japanese influenced pottery produced in Staffordshire, England that was modestly priced, mass produced, and ubiquitous for that short period. Below is an example of that. 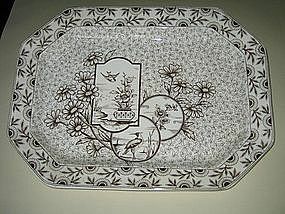 If you are looking for something to collect, e-bay is full of affordable examples today. There was also a fad for designing "tiles". The artists of the day were very interested in decorative design and made and exchanged small square painted tiles of geometric and naturalistic abstract design. 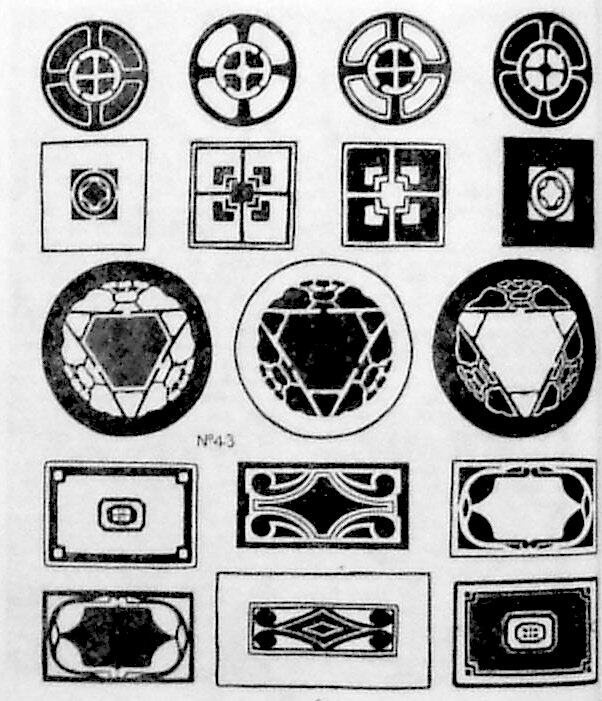 There were clubs started where artists would do these designs together and often present them to one another. This became a fad, but was seen as a good way to build design skills. Here is an example of that from Dow's book. See? we are back with Arthur Dow! The book is a lesson plan for teaching design and is full of suggested exercises. He leads his readers through increasingly complex design ideas. The earliest lessons are about linear design, but as he continues, he leads into Notan. 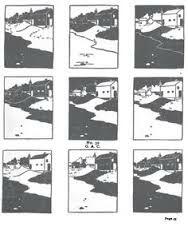 Notan is an idea that Dow borrowed from the Japanese that means designing images in several flat values in a tonal manner. 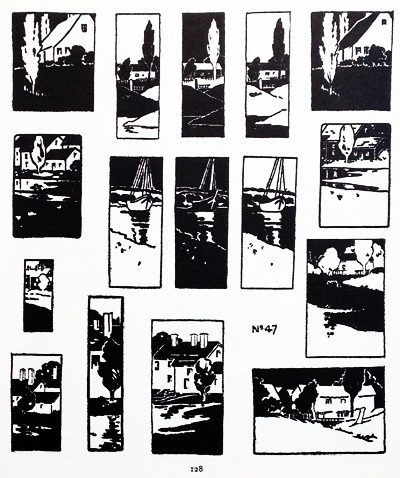 It is rather like thumbnailing as a means of arriving at the arrangement of a picture. This is a purely art for arts sake system, as it is not about transcribing nature, although it may incorporate natural forms. The idea is to create an arrangement of shapes that is beautiful in and of itself, rather than because of its skillful reproduction of a scene before the artist. Above is an example of the simplified Notan sketches that Dow advocated. As you can see he is pushing a single picture idea through various treatments of value and arrangement, looking for an artistic presentation of his subject. 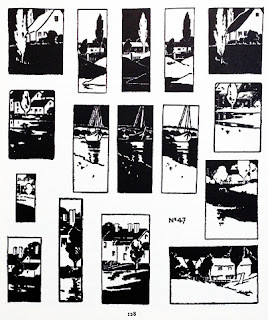 They are all of the same house and tree but with different value arrangements and different "treatments" had by varying his interest in different parts of the image. Some emphasize the tree for instance and others the architecture. In some he switches the values about at will using a dark tree in one and a high value tree in another. His values and drawing are slaved to his design! Here is an example of Edgar Payne,in his book "composition of outdoor painting" a generation later espousing the same ideas. Dow's book is available still, reprinted by Dover. Here is a link to that. It can also be read online at archive. org here is a link to that. If it is actually snowing there is an enormous covered back porch that overlooks the mountains on which we can paint . The camaraderie is wonderful and many students repeat year after year. I limit the class to about a dozen, so if you want to come, sign up using the button below. I is required that you stay in the inn to participate in the workshop. Before you sign up you probably want to call them first and book your room. Their phone number is 603-823-7244, they have a special package rate for my students. I do teach and I do travel. If you are interested in booking workshops or having me visit and teach at your institution, school or art association please email me at stapletonkearns@gmail.com I am presently booked for several workshops in the coming year and will be announcing more . If you are interested in attending a workshop please let me know as well.